You saw this, now see this. Jeremy Scott releases the video lookbook to his fall/winter 2012 collection. Flying teddy bears, Charlotte Free bouncing around (was that the middle finger?) and exploding keyboards--even though it might not seem possible, the brightly colored outrageous collection is brought to life even more so in this short video. We imagine there must have been a lot of trampolines on set. 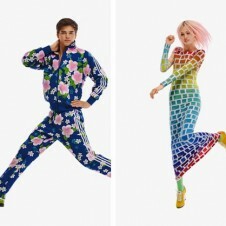 Watch the Jeremy Scott f/w '12 video lookbook below.